You will have seen a lot of information on our website about how FutureTDM is engaging with stakeholders on the issue of content mining through a series of events known as Knowledge Cafes. If you work in content mining, big data and/or data analytics, our events allow the FutureTDM team to talk to you, face to face, to hear why you think people aren’t doing more text and data mining in the EU. This information can then be fed back into the project where, after expert analysis of the TDM landscape, policy recommendations can be made. 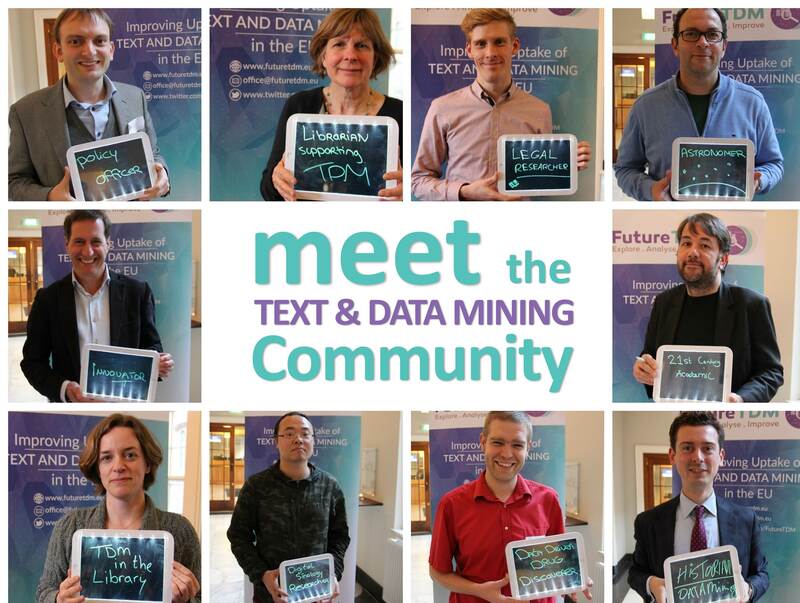 And to show the variety of the backgrounds of people involved in TDM, we will be asking our event participants if they want to be included in our “meet the text and data mining community” collage. Here is the first one from our Leiden Knowledge Cafe. We look forward to the next instalments from our upcoming events at the Dutch Presidency Open Science Conference on 5 April and the London Book Fair on 12 April. Except where otherwise noted, content on this site is licensed under a CC-BY Creative Commons Attribution 4.0 International license.